FAIRFIELD — Two months ago, the New Canaan Rams were 3-2 and were staring at a lost football season with no playoffs for the first time in 14 years. Now, they’re ready to rumble for a state championship. 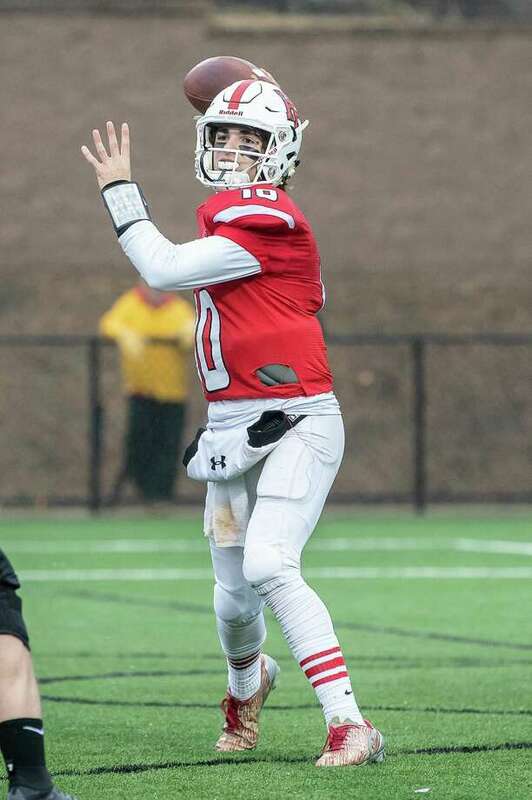 New Canaan delivered its most complete performance of the season on a big stage as the Rams rolled to a dominating 38-7 victory over Fairfield Prep in the CIAC Class LL semifinals Sunday at Rafferty Stadium in Fairfield. The Rams put up nearly 500 yards of offense and the defense was stifling, allowing Prep just 71 total yards in the first half en route to the win. New Canaan will be making its 11th appearance in the state finals in the past 13 years, after missing out on the title game last season. No. 8 New Canaan (10-2) will square off against No. 2 Greenwich (12-0) in the Class LL final next Saturday, Dec. 8, at a site and time to be announced. Greenwich routed Newtown 50-0 in Sunday’s other Class LL semifinal. It will be a father-son match-up, as Greenwich is coached by John Marinelli, the son of New Canaan head coach Lou Marinelli. Earlier this season, Greenwich defeated New Canaan 42-14 at Dunning Field. On the other side of Sunday’s game were the fifth-seeded Jesuits (10-2), who will be graduating nearly 30 seniors from their roster. The final game for so many players made for an emotional post-game talk. “You’ve got to be humble in losses as much as you are proud of victories,” Prep head coach Keith Hellstern said. “The pride I feel for my team and the coaching staff and the support that we have here at Prep is immense. New Canaan had a few huge games on offense, with junior quarterback Drew Pyne completing 22-of-28 passes for 222 yards and one TD. Senior running back JR Moore rushed 23 times for 147 yards and a pair of touchdowns, while senior co-captain Quintin O’Connell had 11 receptions for 76 yards and rushed six times for 57 yards and a TD. For Prep, wide receiver Finn Duran was the offensive standout with eight catches for 157 yards and a touchdown. New Canaan’s offense set a good tone early, taking the opening possession and covering 65 yards on eight plays for a touchdown and a 7-0 lead. The Rams clicked on the ground and through the air on that drive, with Pyne completing all four of his passes for 39 yards, and Moore rushing four times for 26 yards, including a one-yard dive through a goal line scrum for a TD. Nick Radman booted a 20-yard field goal on New Canaan’s second drive to make it 10-0 after one quarter. Throughout the first half, the Rams’ defense, led by strong line play from Braden, Jack Stewart, Jack Conley, Harrison Skyrm and Keiran Buck, was stifling. In the first two quarters, Prep had just 71 yards of total offense, with 42 of that coming on one pass play from QB John Iaropoli to Duran. The Jesuits made some noise late in the half, moving the ball to the New Canaan 22-yard line with under two minutes on the clock. Braden then made a key play, coming around the end and knocking the ball away from Iaropoli. Keiran Buck recovered back at New Canaan 41-yard line and two plays later, Pyne hit Wyatt Wilson deep down the middle for a 52-yard touchdown and a 17-0 lead at halftime. The Jesuits finally got on the scoreboard when Duran caught a pass from Iaropoli for a 15-yard TD with 4:15 remaining in the third quarter. New Canaan responded quickly. Pyne connected with Zach LaPolice for a 28-yard completion to the Prep 28, and Christian Sweeney ran another nine to the 19. After another Pyne-to-LaPolice strike put the ball at the 11, Moore carried it in on the next play for a 24-7 lead. The Rams added two more TDs when Skyrm recovered a Moore fumble in the end zone late in the third quarter, and O’Connell ran in a 23-yard TD with 5:33 to play in the game. The two semifinalists now head in opposite directions, as the Rams look forward and the Jesuits look back. DE Garrett Braden, New Canaan. Braden was one of the Rams’ many stars on defense, as he was constantly in the backfield and in the face of Prep QB John Iaropoli. His strip of Iaropoli in the second quarter turned the game, as the Jesuits were driving and could’ve cut the deficit to three at halftime with a touchdown. Instead, the Rams recovered the fumble and scored for a 17-0 lead at the break.